A small departure from my usual posts. This is to do with food, which those who know me is something that also takes up a fair bit of my time. In our house we do love our soup. So here are a couple of our favourites. Another favourite dish of ours is chicken goujons with salsa and saute potatoes. I am talking here about the salsa as it is the basis for one of the soups. I used a half a yellow pepper too as it was in the fridge. Cut the red and green peppers, deseed and then chop into fine cubes. Peel and chop the onion also into fine cubes. Chop the tomatoes into small cubes of a similar size. Chop the garlic and the chili finely leaving the seeds in the pepper if you like fiery food or take them out if you don't, though this salsa is hot in any case. Into the chopped vegetables add a dash of Tobasco sauce and a the same of a hot pepper sauce of your choice, I normally use Encona as it one of the few I can get here in France ( the French seem not terribly keen on spicy food, in my experience). Add a good splash of lime juice and ground black pepper to taste, I never use salt as I feel the Tabasco and hot pepper sauce have sufficient, but I know a lot of folks like their salt so add salt if you wish. Stir it all round thoroughly and there you have a delicious fresh spicy salsa to go with many dishes. Very often in our house there is salsa left over and this is where the soup comes in. For a tasty Spicy Bean Soup the following day put some olive oil in a large pan and put your leftover salsa in, you will notice the salsa has produced a fair amount of liquid. Add to this four or five chopped tomatoes and gently heat through to soften the vegetables. If you have stock add stock if not make up some stock with a stock cube and add sufficient liquid for the number of people having soup. Bring to the boil and let simmer. 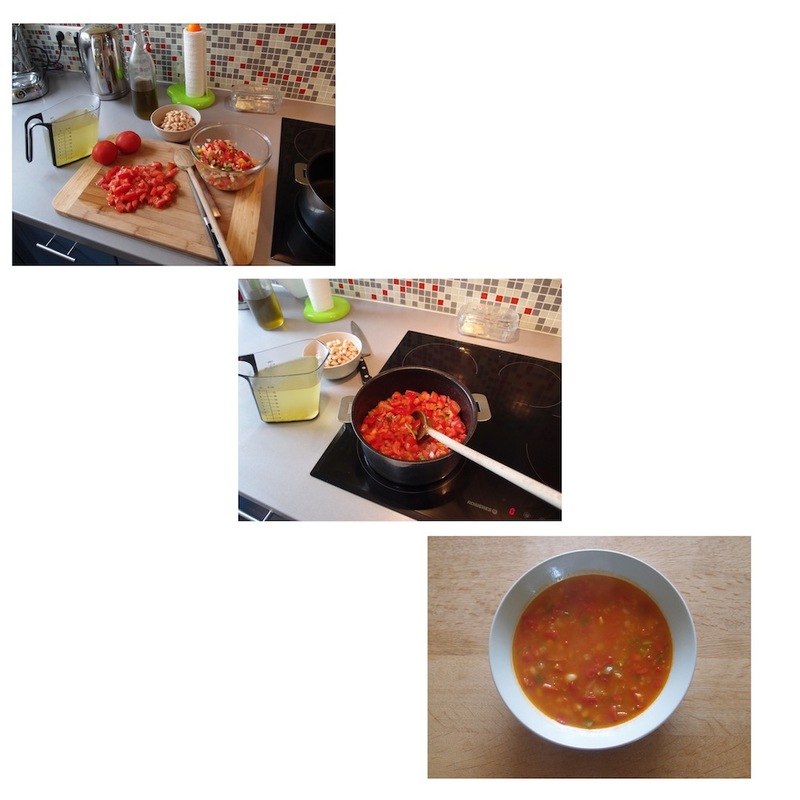 When the vegetables are thoroughly cooked add a tin of cooked beans of your choice, pinto, kidney, borlotti etc all work well, give the beans a few moments to heat through and you are ready to treat yourself with this lovely warming soup. My partner likes to put chopped coriander on top and an extra squirt of lime juice. The second soup or Itchy Soup as it is known in our house is a hearty lentil affair, simplicity in itself and served with good bread is a satisfying meal. Peel and chop the onion put it a pan with a small nob of butter or a little oil, peel and grate at least two carrots, and put them in the pan. Peel and chop or slice the garlic depending how you like it and add to the pan, add few shakes of the dried basil ( I use dried as it just gives us the flavour we have been accustomed to, you can use fresh if you have it, but do try it with the dried as it is different), add the lentils (most often I use the red ones but, the green or blonde give an equally good result, Puy lentils take that bit longer to cook, the red will cook in about twenty minutes), add a tablespoon or so of tomato puree and then add a liter of stock or water and a stock cube (vegetable or chicken work best). Turn on the heat bring to the boil and let the whole lot simmer till the onions are cooked. You could of course saute the onions first but with this recipe there is no need, everything goes in together and once the onions are tender the red lentils will certainly be cooked. Other lentils may take a bit longer, just test now and then till you are happy with the tenderness of the lentils.